The London food scene is ever-changing, with restaurants focusing on one food type having become a popular choice over the last year or so. Alas, this choice introduces added pressure: if you decide to keep your menu simple, punters will inevitably expect (or at least hope) each item will be cooked to perfection. Part of Whitebread PLC, owners of Premier Inn and Costa Coffee, Bar + Block Steakhouse on York Way is one of these restaurants. One of three locations under the Bar + Block umbrella, it promises an ‘all-day dining experience’ of ‘high-quality steaks at high-street prices’; the focus being on quick, good food at affordable prices. Following a pre-Christmas soft launch, Bar + Block Steakhouse is becoming well and truly embedded in the fibre of King’s Cross. I must admit, some preliminary research left me feeling apprehensive ahead of my visit. The consensus seemed to be that the dishes leave a lot to be desired. But, let’s keep an open mind. Located next door to the York Way Premier Inn (perhaps unsurprisingly), the décor here is clean and modern, with comfy-looking red leather booths and a Chef’s Table taking centre stage. 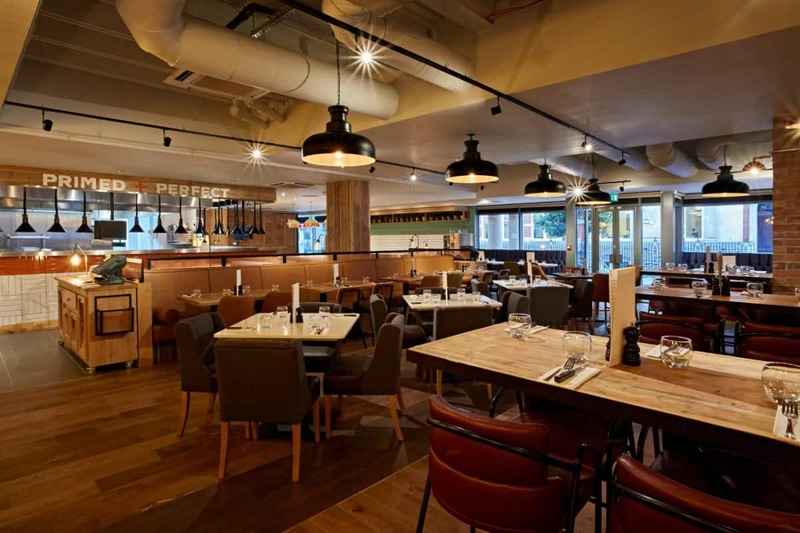 The general look and feel is reminiscent of an American-style steakhouse, with a pleasant mix of smart and casual. We’re shown to our seats by the evening’s host and given the bad news that neither the stone-baked flatbread or cheese and chipotle dipper sharers are available that evening. Remember that open mind? Still, the steaks are what we’re really here for. Sourced in South America and then dry-aged for a minimum of 28 days, the menu promises each 8oz or 10oz steak is hand cut and cooked to order. It must be said that Bar + Block do take their steaks seriously. Each type (from fillet, sirloin, rib eye to their specialty – spiral cut) is accompanied by an explanation of where on the animal it originates, and a recommendation in terms of how it should be served. In addition to the ‘standard’ menu, Bar + Block also offers a Hawksmoor-style ‘Butcher’s Block’, which rotates daily and once it’s gone, it’s gone. Today, it’s a short rib with chimichurri sauce. While we peruse the menu, and pick at beef flavoured popcorn, the restaurant manager, Seb, greets us and we talk briefly. His excitement for the restaurant is contagious. In fact, the staff are all very passionate about the restaurant: each person has a personal recommendation of a dish to try when asked and they do their best for us to have an enjoyable evening, without making us feel uncomfortable with the level of attention we receive. For me, that is a winning customer service mix. We start with a couple of Grey Goose Bloody Mary’s, mini meatballs (£5.95) and beef empanadas (£5.95). Following the beef popcorn (a nice idea actually), the Bloody Mary works well. It’s served in a large red wine glass with a mixture of herbs around the rim, but without a straw. The mix is mild, but tasty, though without a straw, the whole thing is a little difficult to consume. The mini meatballs are a mix of beef and pork mince, with a (supposedly) spicy tomato sauce, fresh basil and parmesan, served with a toasted ciabatta. The bread is fluffy, yet with a little crispy crust, which compliments the dish nicely and the meatballs are tasty, too. But the sauce does leave me a little tepid (much like its temperature). On the other side of the table, the empanadas are going down a treat, though the salsa has too much coriander and the tomatoes used have clearly seen better days. For our mains, we decide to follow the advice we’ve been given and select the Butcher’s Block and the 8oz rib eye (£16.50), served medium-rare with a peppercorn sauce (£1.50) and chunky chips cooked in beef dripping (£3.25). Like the starters, the mains are quick to arrive (a little too quickly, perhaps). But it is steak, so only a few moments in the pan are needed, followed by some resting time. The rib eye is spectacular, cooked perfectly and melts in the mouth, with a decent peppercorn sauce and fluffy chips. The short rib is well cooked, too, and falls off of the bone. The issue here, however, is the sauce. The chimichurri is extremely runny with a lot of olive oil and a few herbs, which sink to the bottom of the pot never to resurface again. Thanks to the meal being served on a block of wood with no edges, there’s no option to pour the sauce over it, unless I’d be happy for it to end up on my lap. Needless to say, I am not. Without the sauce, however, the meat is dry. I’m left longing for a smoky barbecue glaze, or indeed a better chimichurri. Although very nearly full, we can’t help but indulge with desserts: triple chocolate brownie (£5.95) and baked cheesecake (£5.50). Again, arriving within a few minutes, the brownie is served warm, with a scoop of vanilla ice cream, which along with the chocolate chunks and toffee sauce makes it absolutely decadent, reminding me of a Rocky Road Sundae. The cheesecake is soft, but flavoursome, and is a good end to the night. Overall, the meat that’s at the forefront of Bar + Block is cooked rather well. Yet, as a unit, some of the dishes do, unfortunately, leave a little to be desired. Bar + Block King’s Cross can be found at 26-30 York Way, London, N1 9AA.